Ci siamo quasi. Dark Rock Chronicles prossimamente vedrà la luce anche in versione inglese, pubblicato da Diego Comics Publishing. 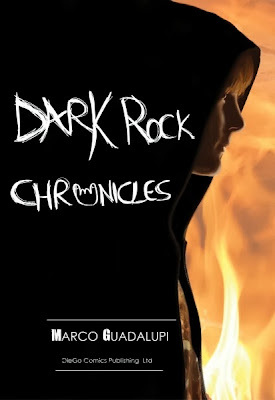 The countdown has started: soon Dark Rock Chronicles will be on sale online and book stores both paperback and hardcover. Meanwhile have a preview of the cover. You may read the first chapter for free at www.diegopublishing.co.uk. Happy reading. Matt, Axl, Duff and Saul live in a universe where rock music is the center of everyone's daily life. Their dream is to become a professional rock band, unfortunately for them they have no money for proper equipment and not only that, they lack the necessary experience. On a day like any other, their attempt to make it big, is crushed due to a failed robbery, a mysterious house and a psychologically disturbed demon. 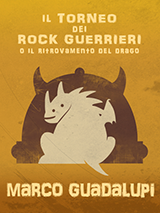 This creature then forces Matt and the others to participate in the Rock Warriors Tournament, a legendary and bloody competition where musical instruments become weapons and where dragons, crazy metal-heads and dirty hits are permitted by the Tournament Regulation!